By buying this product you can collect up to 139 Yachtaid Points. Your cart will total 139 points that will be converted into a voucher towards your next purchase! Must be logged in to collect points. The Nova Kool R1200 is designed to replace popular ice makers like the U-Line 95 series, when a refrigerator is desired. It features a reversible, brushed stainless door. The R-1200 does not have a freezer, leaving room for wine bottles and other beverages. The flange is moveable, allowing for a flush door when the cabinetry is sufficiently deep, or accomodating cutouts as shallow as 14.5″ with the door outside the cabinet. Compared to the U-Line 95 series, the size is about 5/16″ (9mm) shorter, exactly the same width, and about an inch (25mm) less deep with the door set flush. It utilizes a front vent, so no openings are needed at the rear of the cabinet. Nova Kool refrigerators feature the proven Danfoss compressor for long life and high efficiency in any weather. 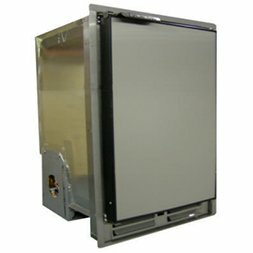 Doors have magnetic gaskets for a positive seal, are reversible, and the door panels are replaceable. Stainless hinges and fasteners, and an epoxy-coated frame make it perfect for the marine environment, as well as for RV use.